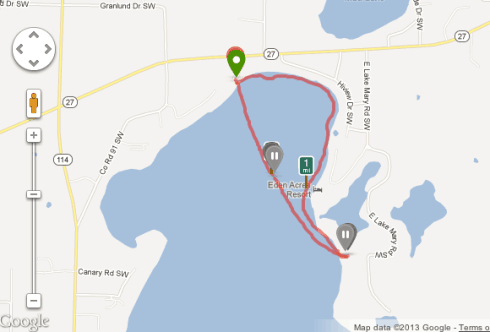 A screenshot of my route that was recorded with an app called RunKeeper. Late this morning I headed to the Public Water Access at the north end of Lake Mary in Alexandria with my Stand Up Paddle Board. It was a little chilly but not bad at all especially after paddling for a few minutes and raising my body temperature. I saw a total of around six or seven boats on the lake and all but one were fishing. It was an enjoyable paddle and it is easy to see why so many people like this lake. Lake Mary is one of the larger lakes in the Alexandria, Minnesota area with over 2,400 acres to enjoy. A nice feature property owners benefit from is the short distance from the south end of Alexandria as a trip to Target or WalMart is only a short drive. But, the best feature of course is the scenery. From Oriole Lane at the south end of the lake to North Lake Mary drive at the north end it is 3 miles. At its widest point near the center of the lake it is about 1.2 miles wide from east to west. Some of the most desirable shoreline is found at North Lake Mary Road, Hiview Drive, East Lake Mary Road and Oriole Lane (there are other nice locations too but am using past sales as the judge). A panoramic view of part of Lake Mary’s northern end. Note in the photo above where I paused my tracker in the middle, that is where I shot this photo. Interested in life at Lake Mary? Check out what real estate is currently for sale with frontage on Lake Mary.